My general manager challenged us to retrain our brains on the concept of happiness. As humans we say “If I do this, or get this, or have this… I will be happy.” Sometimes happiness can come first. When I was blogging, I felt happier. Just to express myself felt good. And although I do not feel like a talented writer, I am going to blog more often. It takes 21 days to retrain your brain! I told myself I needed to try something new. Transferring to Aegis of Kent I have been reinvigorated in trying new art. I do not consider myself an artist AT ALL, but I am trying something new. I am trying and enjoying it. It has proven to be a great way to decompress in the evening. Tonight I attempted a lion and used chalk pastels. Old people say the darndest things…. One thing I love about keeping a blog is being able to go back and read memories from the past. Especially funny things my oldies have said or done. They make me happy and bring me such joy. Although this was from a Facebook memory, I still wanted to share a past oldie comment and a current comment from the other day. I have the best job ever!! 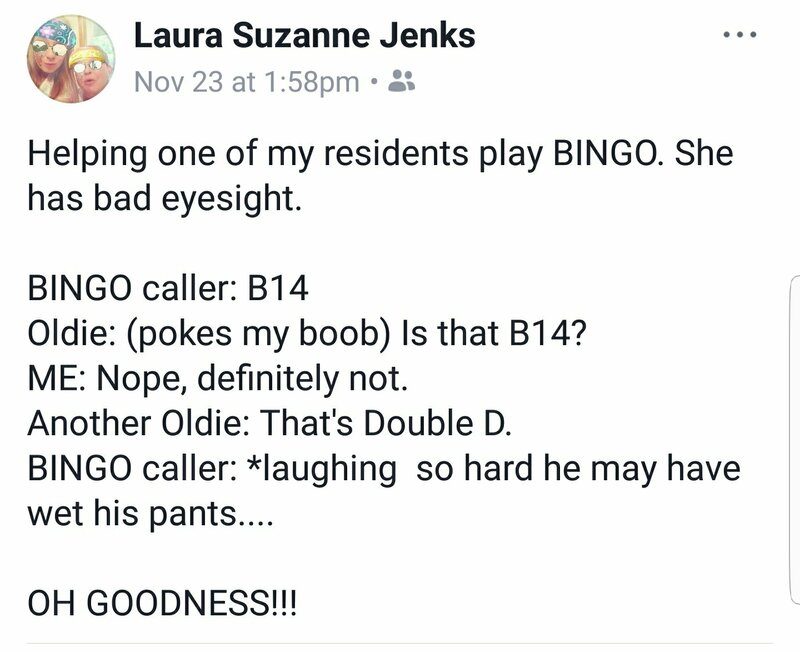 Author laurasznnPosted on November 27, 2017 Categories Life, Life Enrichment Director, WorkLeave a comment on Old people say the darndest things…. Today I was promoted and demoted, all within 8 hours. Getting to spend the day with the president of Aegis Living was inspiring and educational. You can tell how an employee immediately feels about their supervisor by the way they speak to them and about them. I learned very quickly (and have known for a while) how many people respect and honor Judy. You can see the trust people have in her and how seriously she takes that trust. Anyone who says there is not room for humor and fun in the workplace is working in the wrong place. You can lead a team and have them respect and listen to you at the same time. Everybody was so happy today! Now I know it might not always be that way but EVERYBODY was happy to be at work and looked like they enjoy what they do. I think that is a direct correlation to our leadership at Aegis Living. It really is important to be happy, joke, and have fun at work! 3:52:51… That is how long the monthly meeting was this morning. (And they get to do it again tomorrow!) And although breaks were scheduled, they did not get them because it was more important to offer support. Yes, this meeting could be deemed boring but it was important. I have always heard about variance calls but really did not know what was involved. No matter where census was for a community, the leaders patiently listened, cheered on, and coached those involved. These meeting could easily be turned into a negative experience but it really was a time to reflect, make goals, and support each other. There is a time and place for everything (including performance reviews) and the people involved in these meetings know this full well and mentioned how it was not a time to embarrass people or belittle but to support and honor hard work. And really that it is never okay to belittle or embarrass someone. Judy says thank you to everybody. It feels nice to be thanked and it such a simple thing to do. I have recently been actively seeking opportunities to verbally say thank you and physically write a card of thanks to those around me. Judy is great at this. I have work to do at this. Judy works hard! Judy needs more hours in the day. I am so amazed at how she can do 5 things at once and not lose concentration or track of what is going on. Judy works hard because she honestly and truly cares. Quote of the day, “Be honest quicker!” I mentioned that this was something I noticed about Aegis Living within the first couple months of working with them and something I had not experienced at other work places. We are humans, mistakes happen, but it is even more important to be honest and take accountability. I feel it is so easy to talk your way around situations but Aegis Living is wonderful at taking accountability and learning from experiences. It is obviously hard to be wrong, but oh so rewarding to not lose trust and respect by being honest. I learned there is a difference between doing the right thing and a need to be financially stable and responsible. I learned Aegis Living will do anything in their power to help someone out, but being financially stable is also important in making sure buildings are properly maintained and that there is enough staff to do the work needed. It is not ALL about the finances, but they are important too. I learned (already knew it!) how much I despise the word boss! I hope someday I can learn to be the type of boss Judy is. Judy leads with respect but does not hold herself higher than others. Judy cares about what she does and cares about the people she works with. Judy has obviously learned a lot and wants to mentor and teach and encourage those around her. Judy is smart! She is really smart! I also learned I am not done learning from Judy! I want to learn more and have a list of questions to still ask her. I have AMAZING MENTORS! I sometimes can not believe how lucky I am to work with such smart, supportive, and inspiring people. And my greatest disappointment of all: I didn’t get a photo with Judy! But I did get one with the CEO and Owner, Dwayne Clark. Some days are by far way better than others. I have an appointment next Monday, BRIGHT AND EARLY, on my day off to get my oil changed. This morning while driving to work the oil light came on. I pulled off to Fred Meyers to get oil, just to top it off until the appointment… and dumped it in (as well as the washer fluid which has been empty for a month now). abyss of the front end. I tried shaking the car to see if it would come lose…. No such luck. I googled to see what to do and there suggestion was DUCT tape and a shop rag, BACK INTO FRED MEYERS I GO. I clorox wiped everything clean so the duct tape would hold and drove half a mile away to the auto part store. 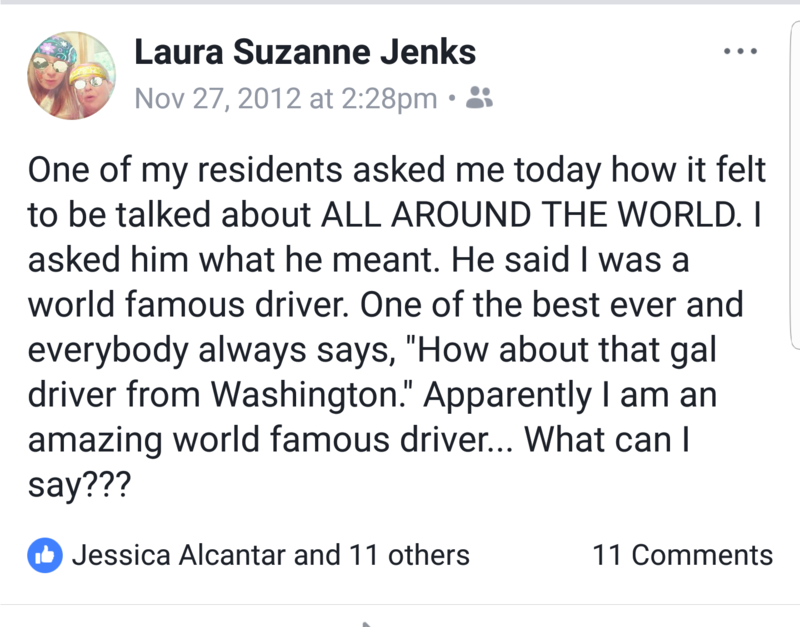 I drove down the hill, through Renton Landing, onto Lake Washington BLVD and CLUNK! GRIND! SHAKE! That doesn’t sound or smell right. I knew either something really bad was wrong or the cap was somewhere it shouldn’t be. I waited 30 minutes for AAA to come and tell me I didn’t need to be towed because he found the cap… all mangled and burned and stinky…. We went on for 5 minutes on if that was really the best choice to drive off or of I should still head to the mechanic… he said his only concern was they sold me the wrong engine oil cap…. UGH!!!! The mechanic agreed I would probably be okay but still extended my appointment on Monday to include some checks. This is such a long story for a short thought: “Can I just catch a break? Please? What have I done to deserve such bad karma lately?” Good news? I didn’t break my Whole30 challenge through this pain. Even better, a coworker asked me today while we were serving pizza if things even still looked or smelled good. I answered of course, the desire is just not there to eat it. When I set my mind to something I am pretty unbreakable.